Winters Blogger Template is a stylish and elegant blogger template which has really great look and is perfect for your personal blog. Winters blogger template will help you to get a unique look for your blog as it has a lot of great features. Winters blogger template is perfect to display daily articles in a beautiful way, the design is responsive meaning the theme looks just perfect for devices such as iPad, iPhone, and desktop, it has a great post format gallery which creates the possibility for you to display images from various format. 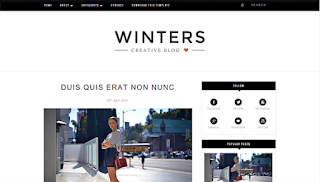 If you were looking for a clean personal blogger template then Winters is a theme for you! Hi, im kira and i have a problem about the date on the template ( winters) the date shows up on my home page as undefined. Is there any way to change that?